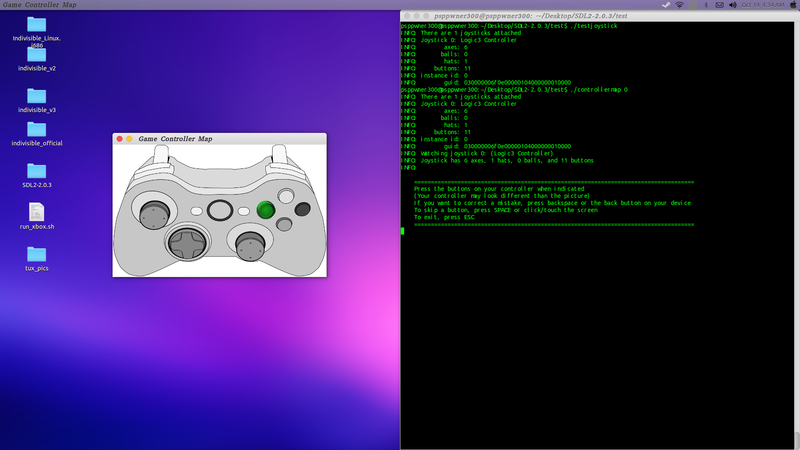 So, you were pressured by that GameStop employee to buy that cheap, store-branded knockoff controller…then when you get home and try it on your GNU/Linux PC, nothing happens, even though jstest can detect it. Or, you have a couple of spare controllers that have been on the shelf for the past six months. Now that you finally have the opportunity to try them out by inviting your drunk penguin buddies over for a game of Gang Beasts, they, out of their half-consciousness, recognize the controller works to a certain extent, but the buttons are not mapped in the right places, with no easy way to remap the controls. What’s going on here? You’re not going to resort to Windows now, are you? I hope not. Some gamepads aren’t officially supported in the Linux kernel. Heck, even if you bought that shiny new $60 Xbox One controller, you’re going to be bummed to find out you can’t play DiRT Showdown with it. This is because your gamepad is classified as generic, and only a small handful of games support these. It’s possible to use SteamOS or just launch Steam in Big Picture Mode (BPM) and most games will now work with the gamepad, but it’s a bit of a pain to have to do that, then reconnecting your controller while in-game, then restarting the application every time you want the support. Plus, navigating with the BPM interface isn’t the most comfortable thing with me. I want to be able to access a game’s discussion board without having to use that ugly, super-buggy web browser that offers little-to-no customization, records your browsing history with no option to turn it off, a bit tedious to multi-task with, and not compatible with any add-ons, while hearing creepy-rear-end music in the background. Yeah okay, I’m exaggerating a bit. I know music can get turned off, and the browser only serves as a quick thing when you need it, but it’s still pretty bad. The question is. is it possible to play a game with a generic gamepad without having to resort to BPM? Can’t say I would be writing this article if there wasn’t a way. Matter of fact, it’s not too difficult to get set up. Apparently some of you are able to reconfigure your controls through BPM, but am I the only exception to this? All I can do is see which controllers are connected. So I have an alternative solution here. Before I get started, I would like to give my personal thanks to Reddit user rohitn for his patience in putting up with all of the questions I had in getting this to work and for his extensive knowledge of GNU/Linux. He would probably answer your questions better than I can if you get stuck. Simple DirectMedia Layer is a cross-platform development library designed to provide low level access to audio, keyboard, mouse, joystick, and graphics hardware via OpenGL and Direct3D. It is used by video playback software, emulators, and popular games including Valve‘s award winning catalog and many Humble Bundle games. SDL (or SDL2) -based games use a controller database file for adding support to various joysticks. Sometimes, you’ll find this file directly within a game’s installation directory. For instance, for Skullgirls, this file is located in ~/.steam/steam/steamapps/common/Skullgirls/gamecontrollerdb.txt. If you find your joystick isn’t working, it’s probably because the information needed for it is not in the file. Fortunately for us, SDL is Free-Software (zlib license), and by downloading and compiling the source code, we can find the needed string to add support for our controller. Let’s go ahead and do that. 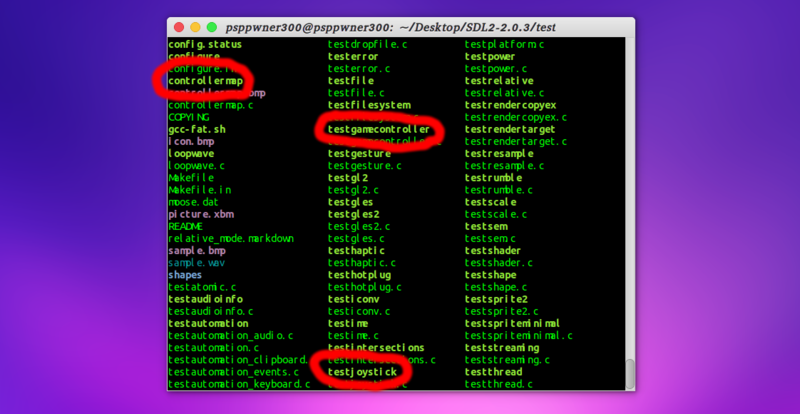 We should now have a few different binary files available; in particular, controllermap, testgamecontroller, and testjoystick. These are the binaries we need for the next few steps. If you haven’t plugged in your gamepad yet, do so now. As far as I’m concerned it doesn’t make a difference whether you have it plugged into a USB 2.0 or USB 3.0 slot. 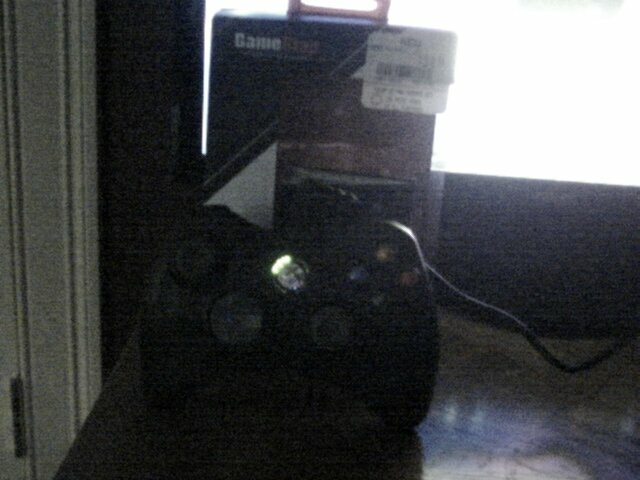 Yeah, I bought that cheap knockoff controller, so that’s what I’ll be using as an example. 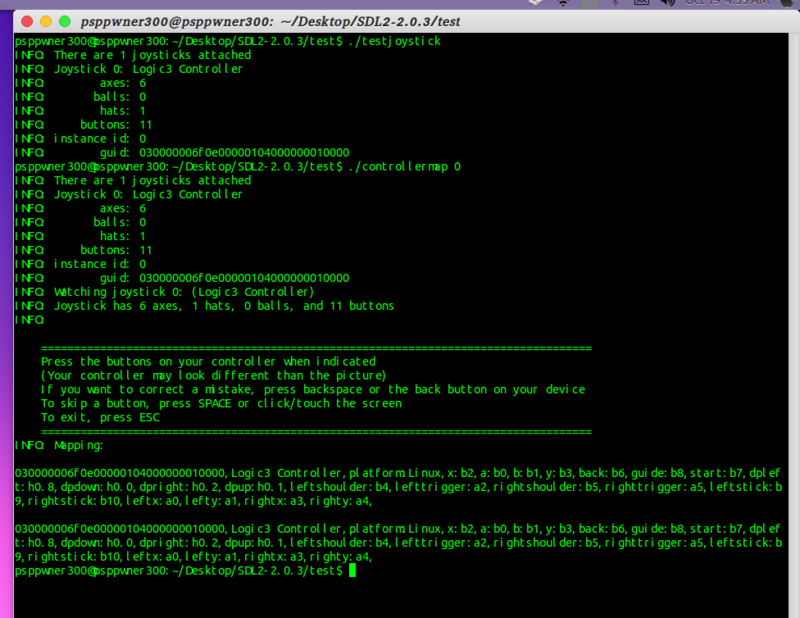 Run either testgamecontroller or testjoystick while still in the terminal. I had to use testjoystick because apparently it’s a joystick, not a game controller. Follow the instructions that are provided. On some controllers I have, I couldn’t map the Guide button, so I skipped it by pressing SPACE on the keyboard. Also, I couldn’t map anything to D-Pad Down because the prompt skips it. When finished, a string should be generated that contains the GUID of the gamepad, the name of the gamepad, the platform the string was made with, and all the mappings you input. For some reason this is printed twice; you can copy either one. Keep this window open; we’ll need it for the script we are about to make. 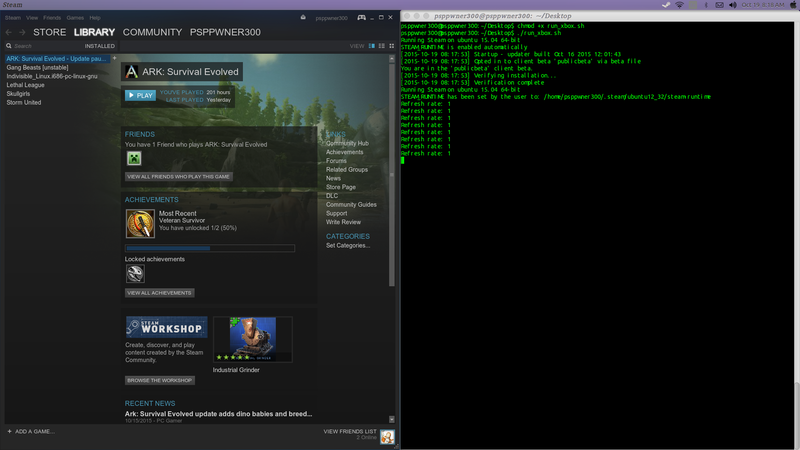 export SDL_GAMECONTROLLERCONFIG="[the string you received from controllermap]"
I replaced the second parameter of the string with “GameStop X360” to give my mapping a more suitable name, and I have set Steam as the executable, so any SDL2-based games launched within Steam should now be able to pick up the gamepad. In other words, all games that work in BPM should now work in desktop mode. If I was desperately looking to get D-Pad Down to work, I might keep changing the value of dpdown till it works in-game, but it’s not much of a concern to me, so I will leave it as it is. If you look carefully, you’ll notice there isn’t a mapping for the Guide button for the second entry. Since the mappings are very similar to the one above it (both controllers are manufactured by the same company), one could probably just add guide:b8 after back:b6 to get it to function. For games that only work with one gamepad at a time, you’re going to have to disconnect the one you don’t want to use; only one or the other is going to work. Local multiplayer games should be able to use both or all gamepads. It would be helpful to add your controller mappings to GitHub if they aren’t there by logging in and making a pull request. Once the request is approved, any games that are released in the future should run with the updated controller database, and you won’t have to run the script with that game. There’s probably an easier way of doing this without having to run this script every time you want the joystick support; perhaps there’s a script somewhere in Steam’s installation directory where we can add our controller mappings. For now, hopefully this at least works for you all. Previous Article← What’s the Steam Link Made Of ? The developers will happily include your config file for your obscure controller (they did it for my $5 one;) in a future patch for these games. SDL input controls were (and still are?) too limited for them. Thanks very much for publishing this. I was able to get this knockoff controller to work with Rocket League (but not Nuclear Throne, oh well). 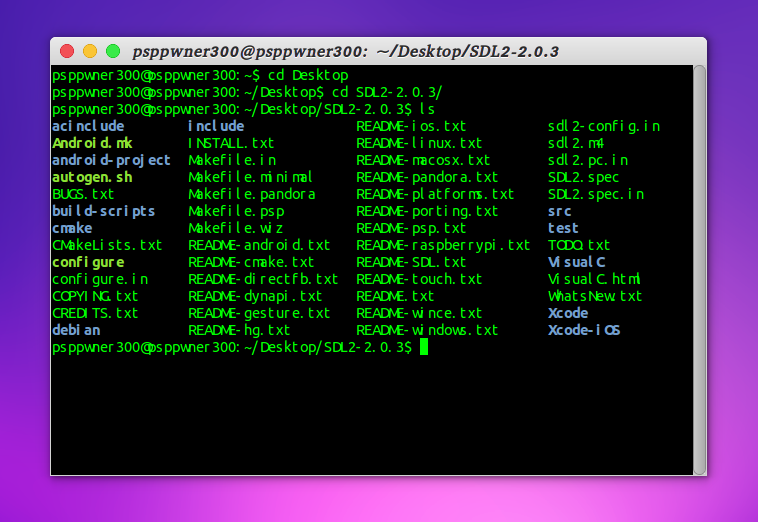 I did need to make SDL and its tests again after installing the additional dependencies. I saw controllermap skip the dpad down too, but, as the instructions say pressing backspace goes back one input, I was able to fix it.